My first and last post was "What is a Cisco Router IOS?" where i tried to explain a little bite about Cisco's Internetworking Operating System. In this post I am going to focus on some most used CLI Prompts which could help you to recognize where you are, at anytime within configuration modes. However, first you must know the difference between user mode and privileged mode. Both of these modes are called EXEC mode, and a prompt is used to tell you which mode you are in. The user mode command line interface (CLI) lets you view and gather the interfaces statistics. This mode is mostly used by junior administrators to document the information for senior staffs. To get in to user mode, you can connect in one of three ways. Console: is an RJ-45 connection available in all Cisco routers which give you full access to router if no passwords are set. 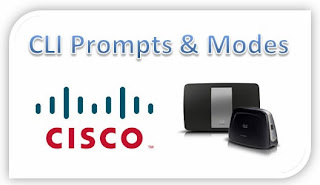 Aux: is an RJ-45 connection on most cisco routers it is same like console with an extra cool feature which allows you to connect a modem to the port, dial into the router, and make a console connection. Telnet VTY: Virtual Teletype is used to allow a telnet connection to the lrouter, which will then work like a console port. You can use Telnet to connect ant active interface on a router, such as Ethernet or Serial port. The above three connections gets you to use mode only, and have nothing to do with how router is configured. to view and change the router lconfiguration you need to be in privileged mode. The prompt which indicates you are in user mode is. your router name and grater-then sign(>) and it look something like this. In order to view and change the router configuration you need to be in this mode. You can get into this mode by first getting into user mode using any of above three ways and then typing command enable. Notice that after writing command enable and entering, the prompt changed from greater-than sign(>) to a pound sign (#) which indicates that you are in privileged mode. After that you are in privileged mode, you enter global configuration mode to change the configuration of a router. As the term "global configuration mode" hence, the changes in this mode effect the router as a whole (globally). you can get into this mode from privileged mode by typing command "configure terminal", I preferred to use the shorcut "config t" instead. Notice that after writing command config t and entering, the prompt changed from pound sign (#) to (config) and then Pound sign (#), which indicates that you are in Global configuration mode. To make changes to router interfaces (like FastEthernet, Loopback, Serial etc...) you enter command interface from Global configuration mode"
Notice that after writing command interface fastethernet 0/0 and entering, the prompt changed from Router(config)# to Router(config-if)# which indicates that you are in interface configuration mode, where you can configure the fastethernet 0/0 interface. Sometimes you would need to create logical interfaces within the router. The subinterfaces allow you to do so. The prompt then changes from Router(config-if)# to Router(config-subif)# which indicates, you are in subinterface configuration mode. You can get into it with the following command. In order to secure your Network it is very important to set passwords on your Cisco router.The line command is used to set/configure passwords of user mode. The prompt then becomes. The prompt Router(config-router)# is used to configure the routing protocols like RIP, EIGRP and OSPF. Here is an example of how you can get into this mode from the startf(user mode). In above practice the last prompt Router(config-router)# indicates that you are in router rip configuration mode where you can configure the rip protocol. well I tried my best to explain all what I knew about the modes and prompts of a cisco router ios in this post. Where I covered the user mode, privileged mode, global configuration mode and there prompts, and as well as interfaces, sub interfaces, lines, protocol configuration and ofcourse there prompts as well. Hopefully this post will help you understanding the core basics of modes and promts. I will be expecting nice and good feedbacks from every viewer, feel free to give comments and feed us with something extra and new if you feel that would needed to be in this topic. Peace and blessings.